Bonn is frequented by business professionals, foreign students and research scholars. 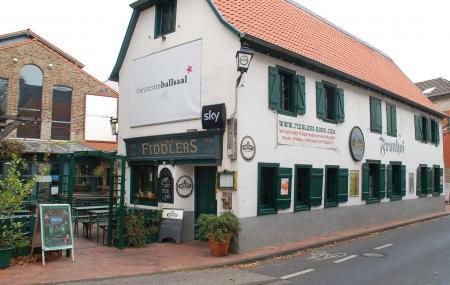 The Fiddler’s Irish Pub is the top spot for a friendly banter in the evening with beer and snacks. Known for its exclusive Irish Craft Beers, the pub is into its third generation of ownership at Bonn. The Fiddler’s Irish Pub is often tagged as a two-floor destination with a ‘triple identity’. It transforms its ambience from a Student’s Pub to a Pre- Show Theatre and Cinema venue throughout its operating hours. The Irish waiters and waitresses serve the best of Irish cuisine amidst a cave-like ambience bustling with 400-odd people at any hour. Weekends are a colourful affair with Johnny Hollywood Karaoke Show and Pub Trivia in parties. Apart from Irish cuisine, the bar also serves Sunday brunch, Celtic, Scandinavian and Bavarian delicacies. An ideal place for a dinner for two or a corporate Finger party! The bar is located very close to the Bonn central station. Entry is reserved for adults above 18 years of age. Only adults with valid ID are allowed to order drinks. Kids are strictly not allowed. Carry cash as the cashier may not accept cards VISA/Master Card. Take-away parcels are allowed but no delivery. Outdoor lounge and patio is available for smokers. Enjoy the free Wi-Fi and parking area with Happy Hour offers. Friendly place for physically challenged individuals. How popular is Fiddlers Irish Pub? People normally also visit Praetorium while planning their trip to Fiddlers Irish Pub. Extremely happy! St. Patrick's Day is my birthday and I've never had such a good time! We'll definitely come back very, very soon! Great, fast service. Lovely service in general. Amazing food. Very good prices. We were there with 10 people and there were hardly any waiting times although the whole place was packed! I'm really, really happy. Thank you very much! I was at this Irish pub last week and felt a good environment. There was a band playing Irish music and was entertaining us. If you would like to have a calm surrounding then you could also sit in other rooms and have a drink. You get all kinds of Irish beer, wishey, rum etc Unfortunately I was there in the midnight and the kitchen was closed. So I cannot comment about the food. I would reckoned this to be a nice place to hangout with friends. Very nice and cozy pub in Bonn. Great food and friendly staff. Enjoyed the Live comedy. Bog standard "international" Irish pub. Offers a reasonable selection of drinks, though not mixed drinks as it is a pub. Venu is large but fairly cosy, it just lacks its own character and feels like a commercialised venue rather than a local community establishment. The prices are typical of competition though still more than one might like to pay. Don't make an effort to get out there but don't feel the need to avoid if passing by.